1. What is the significance of arrow direction on symbol of PN junction? Ans: The arrow direction on the diode symbol indicates the direction of conventional current when the diode is forward biased. A diode is said to be in forward bias, when voltage on p-side is more positive than voltage on n-side. For Ideal diode, even if the voltage on p-side is slightly larger (by a minute amount like nano volts or pico volts), then it comes into forward bias and a large current flows from P to N.
Resistance in forward bias of ideal diode = RF = VF/IF ≈ 0/IF ≈ 0 ohms i.e. 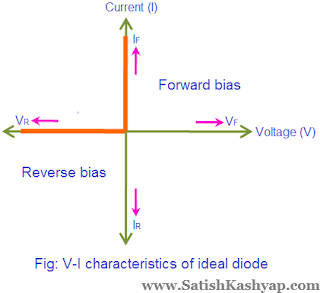 Ideal diode acts as short circuit in forward bias. 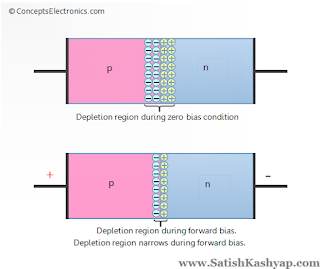 A diode is said to be in reverse bias, when voltage on n-side is more positive than p-side. 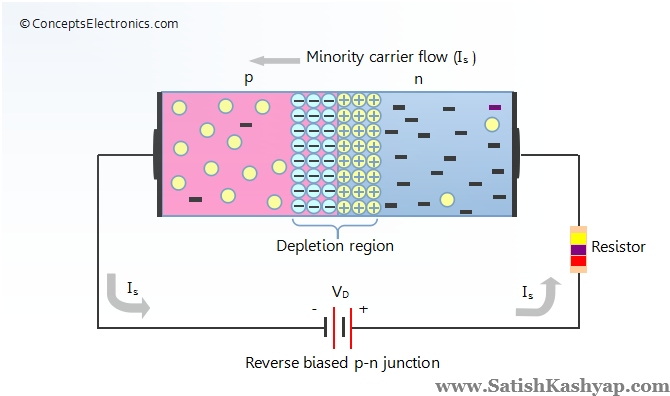 In practical diode, a small current flows in reverse bias due to movement of minority carriers. But in Ideal diode, no current flows in reverse bias i.e. reverse current is zero. Resistance in reverse bias of ideal diode = RR = VR/IR ≈ VR/0 ≈ ∞ (infinity) i.e. 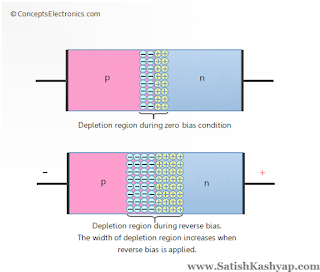 Ideal diode acts as open circuit in reverse bias. 3. Define Diffusion phenomenon. Discuss whether diffusion occurs due to majority or minority carriers in PN junction. 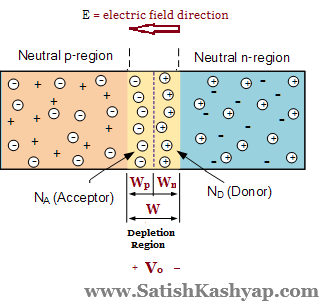 Diffusion is the process of movement of charge carriers from higher concentration region to lower concentration region to make both regions equal, even in the absence of applied electric field. Example: when a purple drop is placed in pure water, initially it will be at one place, which can assume higher concentration region and surrounding pure water is absence of purple color is assumed as lower concentration region. Under steady state (after some time), as a process of diffusion, entire glass of water will be of same purple color i.e. purple has diffused from higher concentration region to lower concentration region to get equal distribution. We know in p-type semiconductor, holes are majority carriers and electrons are minority carriers because electrons are less in number compared to holes. Similarly in n-type semiconductor, electrons are majority carriers and holes are minority carriers. A PN junction is formed when one half of intrinsic semiconductor is doped with trivalent impurities (to get p-region) and other half is doped with pentavalent impurities (to get n-region). 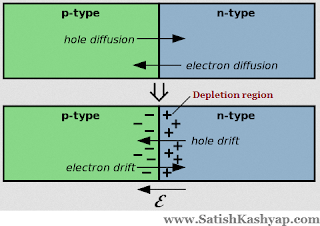 In PN junction, initially holes are more in p-side than n-side and electrons more in n-side than p-side. So due to diffusion phenomenon, charge carriers move from higher concentration region to lower concentration i.e. holes move from P to N side and electrons move from N to P side, which are majority carriers in their respective regions, Diffusion results only due to majority carriers in PN junction. Note: Movement of charge carriers results in current, so a current results due to diffusion of majority carriers from one side to other in a PN junction, which is called Diffusion current. It is always due to movement of majority carriers and is always flow from P-side to N-side. 4. Define Drift phenomenon. Discuss whether drift occurs due to majority or minority carriers in PN junction. Drift is, by definition, charged particle motion in response to an applied electric field. 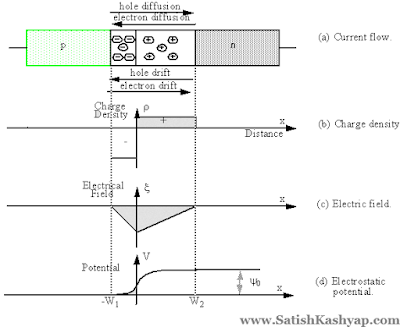 When an electric field is applied across a semiconductor, holes will move in the direction of electric field and electrons will move in the opposite direction of electric field, which results in a current, called drift current. In a PN junction, as a result of diffusion, majority carriers move from one side to other side and creates depletion region, consisting of negative ions on p-side and positive ions on n-side near the junction. Since ions are immobile, there is a fixed positive charge on n-side and equal amount of negative charge on p-side near the junction appear which results in built in electric field, originating in the direction from N to P region as shown. 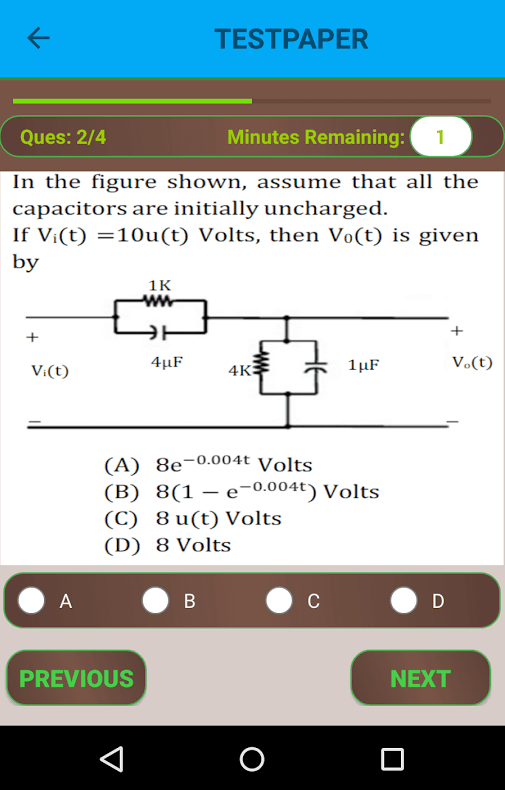 The function of this electric field is to oppose movement of majority carriers to cross the junction but it helps minority carriers to cross the junction by attracting them. Hence minority carriers cross the junction i.e. electrons from p-region enters n-region (opposite direction of electric field) and holes from n-region to p-region (same direction as electric field). Drift definition satisfies to the movement of minority carriers in PN junction. So current due to movement of minority is called drift current. Hence Drift is always due to minority carriers in PN junction. Note: In a semiconductor, both currents, Drift and Diffusion currents can exist. In short Diffusion current depends on concentration gradient (non-uniform semiconductor) and Drift current depends on potential gradient (electric field). 5. Draw the diagram of PN junction at open circuit condition under equilibrium and indicate depletion region widths, open circuit voltage and electric field direction and neutral regions. 6. Prove that the depletion region penetrates more into lightly doped side of PN junction than heavily doped. 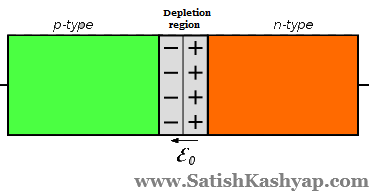 We know, charge present on p-side of depletion region is always equal to charge present on n-side of depletion region. from equation (1), if NA = ND then Wp = Wn i.e. width of depletion region penetrates equally for PN junction with equal doping on both sides. If NA ≠ ND then Wp ≠ Wn i.e. Depletion region penetrates unequally for PN junction with unequal doping on both sides. Hence we conclude that depletion region penetrates more into lightly doped region than heavily doped region of PN junction. 7. For a PN junction, calculate the change in contact potential if the doping on P-side is increased by a factor of 1000 and doping on N-side is unaffected. 9. Define forward and reverse bias. Mention unique characteristics of PN junction under forward and reverse bias. 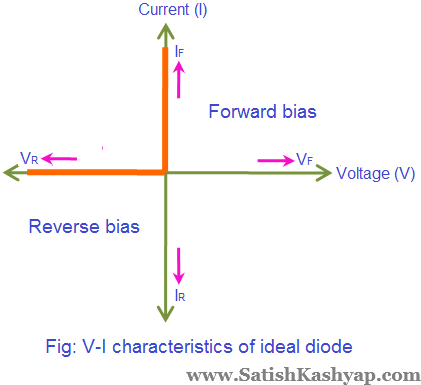 Forward Bias: A diode is said to be in forward bias, if the voltage on p-side is more positive than voltage on n-side. 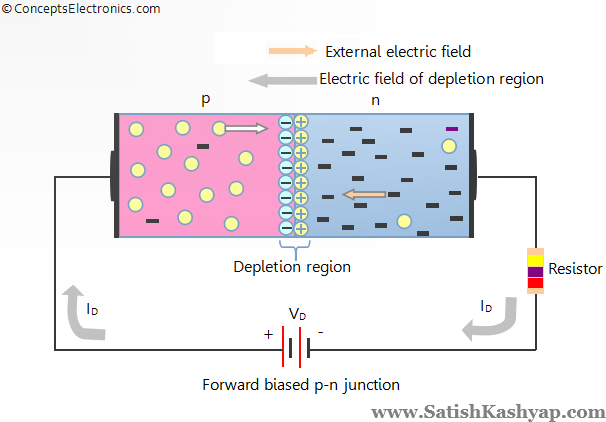 effective electric field across the junction is reduced compared to electric field under open circuit, since the applied electric field under forward bias is in opposite direction of built in electric field, so net electric field will reduced across the junction. Movement of majority carriers (Diffusion current) dominates over movement of minority carriers (Drift current), so net current in forward bias is only diffusion current due to movement of majority carriers and always in the direction from P to N .
since majority carriers are very large in number, forward current is large and is in the range of mA. Because of large current in forward bias, very small resistance is present when the diode is in forward bias. The range of forward resistance is from 10 Ω – 200 Ω. 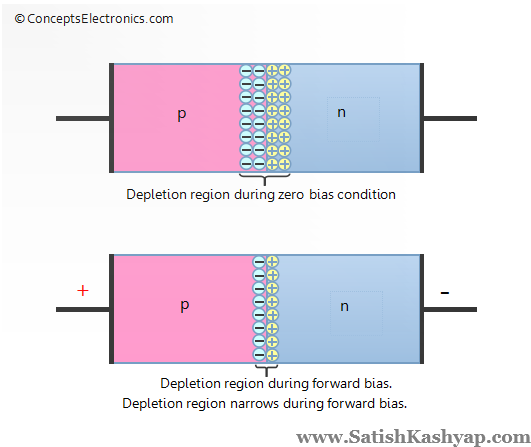 In forward bias, potential barrier of the diode reduces i.e. height and width of potential barrier decreases when compared to potential barrier under open circuit. 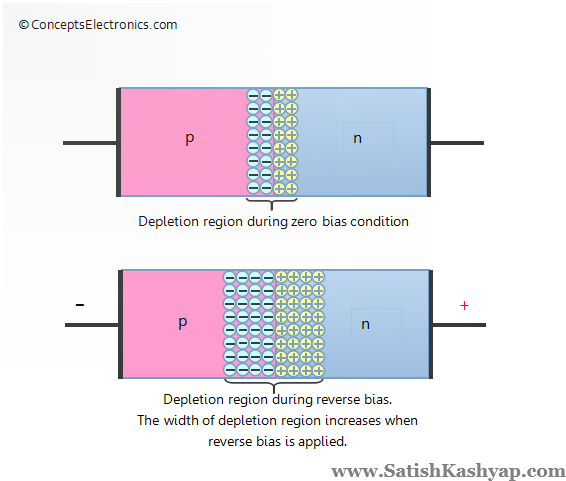 Reverse Bias : A diode is said to be in Reverse bias, if the voltage on n-side is more positive than voltage on p-side. effective electric field across the junction is increased compared to electric field under open circuit, since the applied electric field under reverse bias is in the same direction of built in electric field, so net electric field will increased across the junction. Movement of minority carriers (Drift current) dominates over movement of majority carriers (Diffusion current), so net current in reverse bias is only Drift current due to movement of minority carriers and always in the direction from N to P.
As the name implies, minority carriers are small in number, so current due to minority carriers in reverse bias also small, in the range of µA for Germanium and nA for silicon. We know minority carriers will be created only when covalent bonds break, which depends only on external energy like temperature or light, but not on applied voltage under reverse bias. Hence reverse current is constant for a given temperature, and is independent of applied reverse voltage, because of this reason, reverse current is frequently called as reverse saturation current. In reverse bias, potential barrier of the diode increases i.e. height and width of potential barrier increases when compared to potential barrier under open circuit. 10. For a Step graded PN junction with NA > ND , under open circuit, Draw a neat sketch for volume charge distribution (ρv), electric field intensity (ε) and effective voltage for holes. Note: The magnitude of Electric field will be maximum at the junction i.e. at x = 0.